The City of London Corporation has released updated images of how its City Cluster skyline will look in 2026, assuming six further towers are built. The City Cluster is the area in the eastern corner of the Square Mile and is home to some of London’s most iconic skyscrapers. 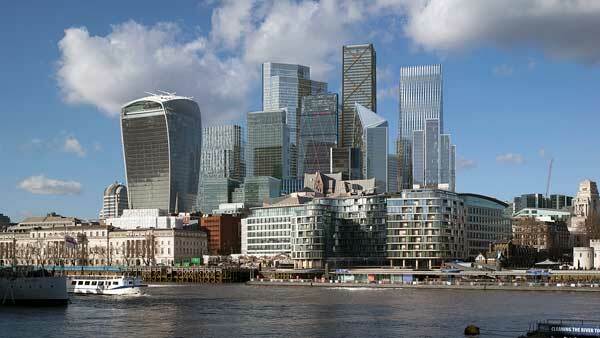 A range of policies set to redefine the area and the wider City of London are currently out for consultation. The Local Plan identifies seven key areas of change where the City Corporation will be promoting sustainable growth. As one of the key areas of change, the City Cluster will grow to close the gap between 20 Fenchurch Street (Walkie-Talkie) and the rest of the cluster of towers. Chris Hayward, Chairman of the Planning and Transportation Committee at the City of London Corporation, said: “These images remind us that the City’s skyscrapers are some of the most recognisable structures in the UK. But great cities are not made from great buildings alone. “The ambitious policy proposals outlined in the Transport Strategy and the Local Plan aim to resolve challenges at street level, and in the river, air and open spaces, as well as ensuring that City buildings and infrastructure are more robust than ever. Currently, seven major steel-framed towers are under construction in the City, while a further six are in the pipeline, including 1 Undershaft which will top out at 304m-high (73-storeys).